By volunteering with A.G. Rhodes Health & Rehab, you’ll have the opportunity to give back to your community and the seniors who’ve contributed so much to our lives. Individual volunteers, families and groups are welcome. We have a place in our hearts (and our homes) for volunteers. By volunteering with A.G. Rhodes Health & Rehab, you’ll have the opportunity to give back to your community and the seniors who’ve contributed so much to our lives. Whether it’s visiting one-on-one with residents or participating in group activities, you’ll find that we offer many volunteer opportunities that will make a lasting difference in your life – and in the lives of those we serve. Individual volunteers, families, and groups are welcome. We have volunteer opportunities at all three A.G. Rhodes locations every day of the week and can accommodate volunteers of all ages. We also have some internship opportunities available. 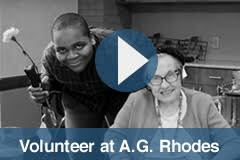 See a list of our most common volunteer opportunities. Please download and fill out an application form to get started. To ensure your information will be saved, it is suggested that you first save the blank form to your device before typing, then reopen the form and fill in the fields.